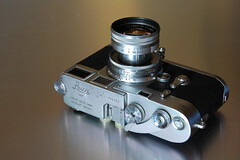 The Leica M3 was introduced in 1954. It was a new starting point for Leitz, which until then had only produced screw-mount Leica cameras that were incremental improvements to its original Leica (Ur-Leica). Leica M cameras are still in production today. 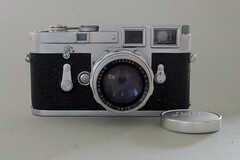 The M3 introduced several features to the Leica, among them the combination of viewfinder and rangefinder in one bright window, and a bayonet lens mount. Early M3 cameras had two throw film advance (two wind movements of the film advance lever) and German shutter speed series (1/25, 1/50, 1/100, etc), which later changed to single throw film advance and international shutter speeds. Except the M5, all models share similar overall dimensions. Accessories, such as the clip on light meter and Visoflex reflex head, will fit most of the versions. 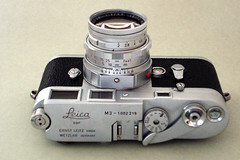 This new bayonet mount, which has not been changed in the following half century, is called the Leica M mount. Lenses can be changed faster than with a screw mount and framelines set automatically. An adapter also allows the use of M39 screwmount lenses. M3 fitted with viewfinder "spectacles"
Compared to the preceding IIIf, the M3 has an exceptionally bright viewfinder. It also has a high magnification factor, which is very useful in critical focusing. 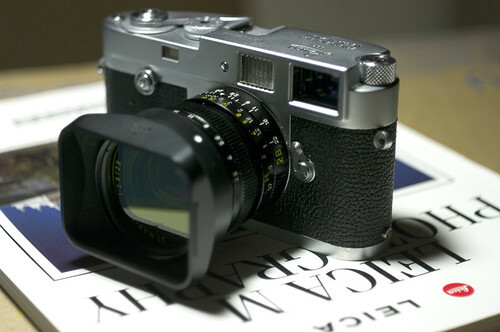 The M3 has a factor of 0.90×, while other Leicas use 0.85×, 0.72×, or less. Furthermore, it was the first Leica to combine rangefinder and viewfinder into one window (other cameras, such as the Contax II, already had this feature before the war and other companies were making screwmount bodies with combined viewfinders). Framelines for 50, 90 and 135mm are shown, although none for any wider lenses. However, Leica solved this problem in two different ways. One was using a separate viewfinder slid into the accessory shoe. 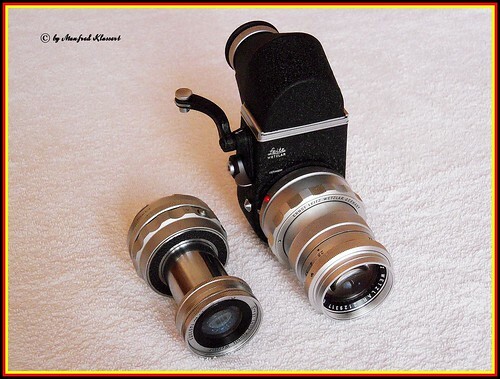 The other way is the use of so called Leica glasses; auxiliary lenses are put in front of the viewfinder and rangefinder windows for the 35mm focal length. The drawback of these glasses is they reduce the famed brightness of the finder. The later M2 with its reduced viewfinder magnification of 0.72× and framelines for 35, 50, and 90mm lenses was introduced primarily at the request of photojournalists who frequently used wide angle lenses. The 50 mm framelines are always visible in the slightly larger viewfinder image. There are two ways to select the 90mm or 135mm framelines. Mounting a 90mm lens will automatically select the corresponding framelines. The other way is toggling a small lever on the left of the lens. This way, the tele-framelines for other lenses can be seen when using a 50mm lens, which shows the field of view for another focal length. 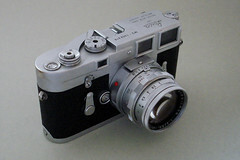 Viewfinder cameras don't show exactly the same image in the viewfinder as on film (parallax error) which is compensated in the M3 by moving the framelines when focussing the lens. At very close distances this compensation is no longer effective. 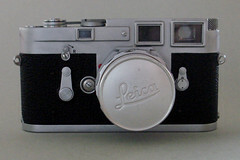 Leica IIIf and its predecessors had used a knob to advance the film. For fear of tearing the film, early M3s had a double stroke advance lever, just as the Neoca 2S had. 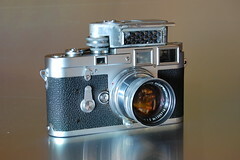 Later models had single-stroke levers, which speeded up operation of the camera. Another variation is in the film pressure plate. Early models used a glass plate to keep the film flat, later models used a metal plate. Focal plane shutter, horizontal travel with cloth curtains. Earlier screw mount Leicas had two shutter controls with separate slow and fast speeds which rotated on exposure, as on the Exakta Varex. 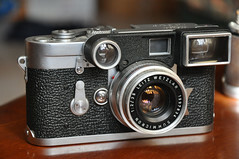 The M3 combined all speeds on a single static dial, partly to reduce vibrations in the camera. Leica's model numbering scheme has often caused confusion among users and collectors alike. The next model introduced by Leica was the M2. This was the M3 with reduced viewfinder magnification and a different selection of viewfinder framelines (35, 50, and 90mm). These changes were suggested by professional photojournalists, who were Leica's primary customers at the time. The self timer was initially omitted, but reinstated on later production. A variant was the M2-Mot introduced in 1967, which could be fitted with a motor winder or the Leicavit rapid winder. 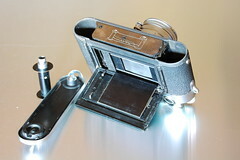 The winder with its battery case was larger than the camera body itself. The M2 was sold alongside the M3 and both continued production with minor changes until eventually replaced by the M4. 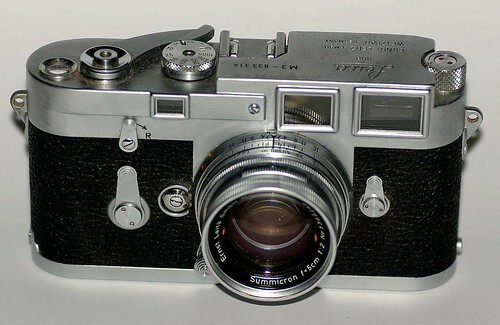 The M1 was also based on the M3 body but without a rangefinder, significantly reducing cost. The MD had no viewfinder at all and was primarily intended to be mounted on a microscope or telescope for use as a scientific instrument camera. 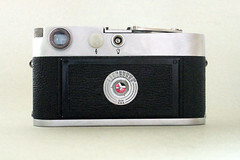 Produced in limited numbers from 1956-57 and available only to established professional photographers. This version of the M3 incorporated the Leicavit rapid winder (manually operated lever on the base) which could not be fitted to the normal M3. Due to the small number produced this version is highly prized by collectors. The Leicameter MR exposure meter clipped on the to flash shoe and coupled with the shutter dial, providing semi-coupled metering (aperture still had to be manually set on the meter). 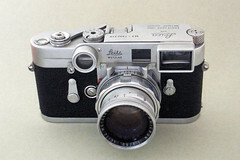 The Visoflex reflex housing turned the camera into an SLR. The bayonet mount was the same but with extended lens mount to film plane distance. Normal M lenses could only be used on the Visoflex for close up photography, otherwise special Visoflex lenses with reduced back focus length could be used for normal photography. Visoflex lenses could not be used directly mounted on the camera. Supplementary viewfinder lenses, often called viewfinder "spectacles", alter magnification for different lenses or close up work. The Leicavit manually operated rapid winder can be fitted to the M2, but not the M3. The standard base plate is replaced by the winder, which has a fold out lever in the base operated by the right hand, while the left hand works camera controls. Up to three frames per second can be exposed using the Leicavit, which does not require batteries. 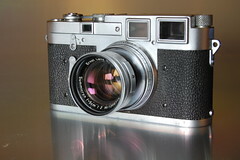 Leica M3 listed at number 10 in Jason Schneider's Top 20 Cameras Of All-Time on Shutterbug. This page was last edited on 14 March 2018, at 06:21.